Kyabjé Chatral Rinpoche, Sangye Dorje (Tib. བྱ་བྲལ་སངས་རྒྱས་རྡོ་རྗེ་, Wyl. bya bral sangs rgyas rdo rje) (1913–2015) was a renowned Dzogchen master, a reclusive yogin famous for his great realization and strict discipline. A disciple of the great master Khenpo Ngakchung, he was widely regarded as one of the most highly realized Dzogchen yogins of recent times. In addition to his relationship with Khenpo Ngakchung, Chatral Rinpoche also studied with some of the last century's most renowned masters, including Dudjom Rinpoche, Jamyang Khyentse Chökyi Lodrö, and the famed dakini, Sera Khandro. Rinpoche was one of the primary lineage holders of the Longchen Nyingtik, and in particular the lineage that descends through Jigme Lingpa's heart son Jikmé Gyalwé Nyugu and then on to Patrul Rinpoche. 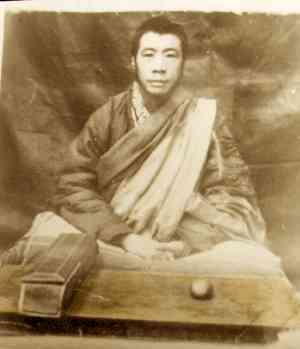 Though his main lineage is the Longchen Nyingtik, Chatral Rinpoche was also closely associated with the Dudjom Tersar lineage. He was empowered as the regent of Kyabjé Dudjom Rinpoche and passed on this lineage to this master's reincarnation, who lives primarily in central Tibet. Chatral Rinpoche shunned institutional and political involvement his whole life, choosing instead to live the life of a wandering yogin. A lay yogin, he was also greatly concerned with maintaining strict discipline in the context of the Dzogchen view. He was especially well known for his advocacy of vegetarianism and his yearly practice of ransoming the lives of thousands of animals in India. In addition to his emphasis on the union of view and conduct, Rinpoche also stressed the practice of retreat. He established numerous retreat centers throughout the Himalayas, including in Pharping, Yolmo and Darjeeling. He passed into parinirvana in Yangleshö in Nepal on December 30th, 2015, at the age of 102. He had two daughters, Tara Devi and Saraswati (recognised as a tulku of Sera Khandro), with his wife Sangyum Kamala. Chatral Rinpoche, Compassionate Action, edited, introduced and annotated by Zachary Larson (Ithaca, NY: Snow Lion Publications, 2007). Chatral Rinpoche, Compassionate Action: the Teachings of Chatral Rinpoche, edited with commentary by Zachary Larson (Kathmandu: Shechen Publications, 2005). Tulku Urgyen Rinpoche, Blazing Splendor: The Memoirs of Tulku Urgyen Rinpoche (Boudhanath, Hong Kong, Esby: Rangjung Yeshe Publications, 2005), pages 304-305. This page was last edited on 16 January 2016, at 14:12.